My first impression of Grapefruit Essential Oil is that its pretty mellow. Unlike some of the stronger, tart oils such as Lemon for instance; this oil gives you that calm, collected undertone that is specific to Grapefruit. As for drinking a drop or two in ice water or adding to recipes, it is fairly low-key. *Traditionally, Grapefruit oil has been used to cleanse and purify the body but it has long been thought to be helpful in energizing the body, flushing impurities and assisting in weight loss. 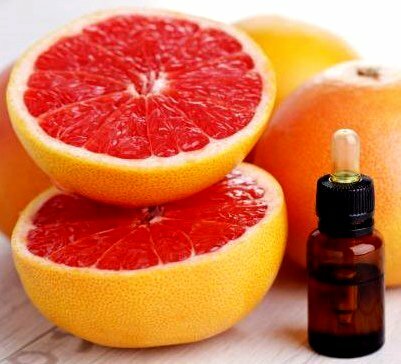 Grapefruit Essential Oil is very high in limonene which is known to be a tumor-fighting, cancer-preventative phytochemical that protects DNA and cells from damage. Not only that, it’s high in Vitamin C! It can be used to help ward off acne, headaches, colds and can help protect against bacterial and fungal infections. The smell of Grapefruit Essential Oil is delightful and goes well with many carrier oils for use in cellulite and lymphatic massage. The scent is so well-loved, many add it to homemade soaps and personal care products, or they may simply use it “neat” as a natural perfume. Those big into aromatherapy love its clean, uplifting scent although I found it to be quite subtle. I look forward to diffusing it this winter while doing some yoga. Even though this delightful oil has a lot of positive attributes you do need to be cautious of when using it. If you apply it topically, avoid the sun as it may cause the skin to be more sensitive to the sun and result in skin irritation. As always, read the bottle to make sure your oil is safe for internal use and check with your physician if you are using any medications. For use in a diffuser for aromatherapy, combine 2 drops each oil in your fresh water. Melt Coconut Oil just until liquid and add the essential oils, stir, seal in a lidded jar. Massage into sore muscle or cramping muscle area – not for use near the eyes or sensitive tissues. Overall, Grapefruit Essential Oil is a great addition to my collection. Used in combination with some of my more overpowering oils I have a feeling it will help make a few of my future concoctions be a little more well-rounded. If anyone would care to share some feedback on how you use your Grapefruit Essential Oil or if your interested in purchasing some great oils I’d love to hear from you! Happy Oiling!